Let's face it. We all need Internet Access from time to time - even when on vacation. Whether it be to check on plane flights, get directions to local restaurants and attractions, or simply to check your email or Facebook page... we need a signal! If you are traveling for business or for pleasure and you own a laptop, the chances are you are going to want to bring it along. One of the biggest obstacles to most people working effectively on long flights is limited battery power. After all, whether you are working on a spreadsheet, a document, a presentation or even if you want to let your kids watch their favorite DVD, you can't do much with a limiting two hours of battery life. So how do you plan and what should you do? First, figure out whether the plane on which you are flying has appropriate power ports. On most planes, if you are traveling in business or first class they will have power ports for you in every seat. The big question is coach/economy and whether or not the plane is newer. If you can, find out from the airline which type of aircraft on which you'll be flying. You can do this over the phone or online, for the most part. Then go to Seat Guru (www.seatguru.com) plug in the information and you'll be able to see if you are going to have power from the aircraft. This is obviously especially useful on longer flights across the country or transatlantic. If you have access to a power port then you should be all set for the duration of the flight. If you find out from taking the steps above that you don't, you need to plan. First, assess what you have. If your laptop is newer you probably have a three hour battery, which may be sufficient for your needs. If you have a used laptop or a refurbished laptop, or just an older machine you may only have two hours of battery for use. Once you assess your power, then you'll need to make a decision about buying a backup battery. This would obviously double your powerless access and it may offer you some additional security as having spares of just about everything, including batteries, on hand usually works out to your benefit. If you need to buy an additional battery, or a newer battery with longer life, one of the best places to hit is Power Plant (www.pwrplant.com). 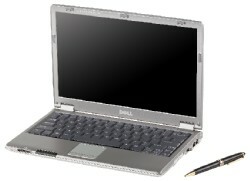 They have batteries and power supplies that work with a variety of laptops for very reasonable prices. This means you can have power from coast to coast which will offer plenty of time to map out all of those ideas or to run through as many Pixar movies as you need to stay sane while traveling. Finally, if you are traveling and you need internet access, check out your airport's website and figure out whether or not they have WiFi. Some places will charge while others offer free wireless internet access. If you're older, used laptop or refurbished laptop doesn't yet have a wireless card, they are really inexpensive for the benefits you will gain. Some airlines are also introducing wireless internet on flights. Lufthansa Airlines, Scandinavian Airlines, Japan Airlines, ANA, Singapore Airlines and China Airlines are all taking advantage of the new Connexion by Boeing program. This program will be coming on more airlines soon so be sure to ask your carrier when they will be bringing it on board! No matter your situation, there are ways to plan for laptop use and access on board your flight. You may as well make your flight as productive as possible! Blair Stephens is an experienced writer and proud member of the www.UsedLaptops.com team. Used Laptops specializes in providing customers with the best possible used laptops and refurbished laptops at bargain prices. If you need computing power at bargain prices, Used Laptops is the place to go!